R. Albert Mohler Jr., president of The Southern Baptist Theological Seminary, delivers a special Heritage Week message in Broadus Chapel, Oct. 15. “Opposition from the world is an opportunity to witness,” said R. Albert Mohler Jr., president of The Southern Baptist Theological Seminary, during a special Heritage Week chapel service, Oct. 15. "The opportunity of greatest Christian witness is not when we think the world loves us, but when the world quite openly hates us." Many Christians know about the persecutions in first-century Rome, the sufferings of Paul, or that of the British Missionary Society. However, Mohler said American Christians have thought the persecution in this passage refers only to those groups, and not themselves. Most American Christians grew up in a society that was not particularly hostile. Recalling his own childhood in Lakeland, Florida, Mohler said the religious diversity he experienced consisted of Baptists, Presbyterians, and Methodists. American Christians cannot imagine suffering for their faith because they read this passage and take refuge in the word “if,” Mohler said. Christians then believe that suffering is not a normative experience because “if” brings conditionality to Jesus’ words. The “if” collapses in light of John 15:20 and the crucified Jesus. Jesus declares that suffering and persecution is the normative experience for all Christians because the world hated him, Mohler said. While Christians do not expect to hear orthodox responses, knowing that worldly views will be unbiblical and insufficient, they do not expect them to be hostile, he said. “We expect to hear that he was a great teacher; he was a wonder worker; he was a great and kind person who helped people; he was a miracle worker; he was a loyal instructor,” said Mohler. Christians expect to hear these sort of responses and what makes the Gospel of John so interesting, Mohler said, is that Jesus is the one saying those who hate him do not appear to hate him. Jesus had a proper understanding of hatred, said Mohler. In biblical terms hatred is a lack of obedience and a refusal to love. Mohler concluded with observations on how the growing threat of persecution in America could alter the purpose of Southern Seminary. "Maybe the mission of this school is actually to train up a generation of preachers, missionaries, and evangelists who will be martyrs," Mohler said. Southern Seminary’s Heritage Week this year included the fall trustee meeting, Southern Seminary Foundation meeting, Preview Day for prospective students, and a celebration of the 20th anniversary of the Billy Graham School of Missions, Evangelism and Ministry. 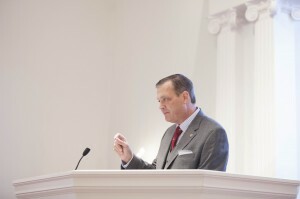 Audio and video from Mohler’s sermon are available at sbts.edu/resources.